Autotrophs (producers) synthesize their own energy, creating organic materials that are utilized as fuel by heterotrophs (consumers). Food webs illustrate how energy flows through ecosystems, including how efficiently organisms acquire and use it. Autotrophs, producers in food webs, can be photosynthetic or chemosynthetic. Photoautotrophs use light energy to synthesize their own food, while chemoautotrophs use inorganic molecules. Chemoautotrophs are usually bacteria that live in ecosystems where sunlight is unavailable. Heterotrophs cannot synthesize their own energy, but must obtain it from autotrophs or other heterotrophs; they act as consumers in food webs. All living things require energy in one form or another since energy is required by most, complex, metabolic pathways (often in the form of ATP ); life itself is an energy-driven process. Living organisms would not be able to assemble macromolecules (proteins, lipids, nucleic acids, and complex carbohydrates) from their monomeric subunits without a constant energy input. It is important to understand how organisms acquire energy and how that energy is passed from one organism to another through food webs and their constituent food chains. Food webs illustrate how energy flows directionally through ecosystems, including how efficiently organisms acquire it, use it, and how much remains for use by other organisms of the food web. Energy is acquired by living things in three ways: photosynthesis, chemosynthesis, and the consumption and digestion of other living or previously-living organisms by heterotrophs. Photosynthetic and chemosynthetic organisms are grouped into a category known as autotrophs: organisms capable of synthesizing their own food (more specifically, capable of using inorganic carbon as a carbon source ). Photosynthetic autotrophs (photoautotrophs) use sunlight as an energy source, whereas chemosynthetic autotrophs (chemoautotrophs) use inorganic molecules as an energy source. Autotrophs act as producers and are critical for all ecosystems. Without these organisms, energy would not be available to other living organisms and life itself would not be possible. Chemoautotrophs are primarily bacteria that are found in rare ecosystems where sunlight is not available, such as in those associated with dark caves or hydrothermal vents at the bottom of the ocean. Many chemoautotrophs in hydrothermal vents use hydrogen sulfide (H2S), which is released from the vents, as a source of chemical energy. This allows chemoautotrophs to synthesize complex organic molecules, such as glucose, for their own energy and in turn supplies energy to the rest of the ecosystem. 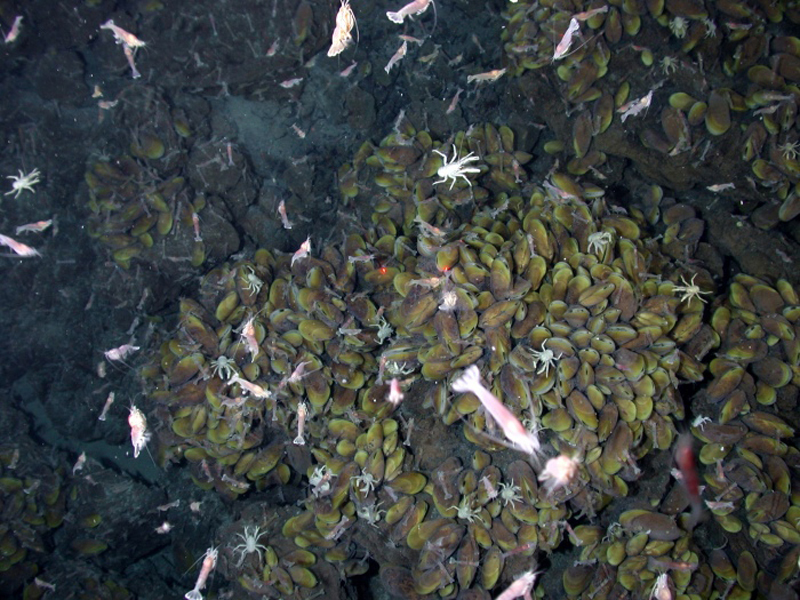 Chemoautotrophs: Swimming shrimp, a few squat lobsters, and hundreds of vent mussels are seen at a hydrothermal vent at the bottom of the ocean. As no sunlight penetrates to this depth, the ecosystem is supported by chemoautotrophic bacteria and organic material that sinks from the ocean’s surface. Heterotrophs function as consumers in the food chain; they obtain energy in the form of organic carbon by eating autotrophs or other heterotrophs. They break down complex organic compounds produced by autotrophs into simpler compounds, releasing energy by oxidizing carbon and hydrogen atoms into carbon dioxide and water, respectively. Unlike autotrophs, heterotrophs are unable to synthesize their own food. If they cannot eat other organisms, they will die. Productivity, measured by gross and net primary productivity, is defined as the amount of energy that is incorporated into a biomass. A biomass is the total mass of living and previously-living organisms within a trophic level; ecosystems have characteristic amounts of biomass at each trophic level. The productivity of the primary producers ( gross primary productivity ) is important to ecosystems because these organisms bring energy to other living organisms. Net primary productivity (energy that remains in the primary producers after accounting for respiration and heat loss) is available to the primary consumers at the next trophic level. biomass: the total mass of all living things within a specific area, habitat, etc. Productivity within an ecosystem can be defined as the percentage of energy entering the ecosystem incorporated into biomass in a particular trophic level. Biomass is the total mass in a unit area (at the time of measurement) of living or previously-living organisms within a trophic level. Ecosystems have characteristic amounts of biomass at each trophic level. For example, in the English Channel ecosystem, the primary producers account for a biomass of 4 g/m2 (grams per meter squared), while the primary consumers exhibit a biomass of 21 g/m2. The productivity of the primary producers is especially important in any ecosystem because these organisms bring energy to other living organisms by photoautotrophy or chemoautotrophy. Photoautotrophy is the process by which an organism (such as a green plant) synthesizes its own food from inorganic material using light as a source of energy; chemoautotrophy, on the other hand, is the process by which simple organisms (such as bacteria or archaea) derive energy from chemical processes rather than photosynthesis. The rate at which photosynthetic primary producers incorporate energy from the sun is called gross primary productivity. An example of gross primary productivity is the compartment diagram of energy flow within the Silver Springs aquatic ecosystem. In this ecosystem, the total energy accumulated by the primary producers was shown to be 20,810 kcal/m2/yr. Energy flow in Silver Springs: This conceptual model shows the flow of energy through a spring ecosystem in Silver Springs, Florida. Notice that the energy decreases with each increase in trophic level. Because all organisms need to use some of this energy for their own functions (such as respiration and resulting metabolic heat loss), scientists often refer to the net primary productivity of an ecosystem. Net primary productivity is the energy that remains in the primary producers after accounting for the organisms’ respiration and heat loss. The net productivity is then available to the primary consumers at the next trophic level. In the Silver Spring example, 13,187 of the 20,810 kcal/m2/yr were used for respiration or were lost as heat, leaving 7,632 kcal/m2/yr of energy for use by the primary consumers. Energy is lost as it is transferred between trophic levels; the efficiency of this energy transfer is measured by NPE and TLTE. Energy decreases as it moves up trophic levels because energy is lost as metabolic heat when the organisms from one trophic level are consumed by organisms from the next level. Trophic level transfer efficiency (TLTE) measures the amount of energy that is transferred between trophic levels. A food chain can usually sustain no more than six energy transfers before all the energy is used up. Net production efficiency (NPE) measures how efficiently each trophic level uses and incorporates the energy from its food into biomass to fuel the next trophic level. Since cattle and other livestock have low NPEs, it is more costly to produce energy content in the form of meat and other animal products than in the form of corn, soybeans, and other crops. In Silver Springs, the TLTE between the first two trophic levels was approximately 14.8 percent. The low efficiency of energy transfer between trophic levels is usually the major factor that limits the length of food chains observed in a food web. The fact is, after four to six energy transfers, there is not enough energy left to support another trophic level. In the Lake Ontario ecosystem food web, only three energy transfers occurred between the primary producer (green algae) and the tertiary, or apex, consumer (Chinook salmon). Food web of Lake Ontario: This food web shows the interactions between organisms across trophic levels in the Lake Ontario ecosystem. Primary producers are outlined in green, primary consumers in orange, secondary consumers in blue, and tertiary (apex) consumers in purple. Arrows point from an organism that is consumed to the organism that consumes it. Notice how some lines point to more than one trophic level. For example, the opossum shrimp eats both primary producers and primary consumers. Ecologists have many different methods of measuring energy transfers within ecosystems. Some transfers are easier or more difficult to measure depending on the complexity of the ecosystem and how much access scientists have to observe the ecosystem. In other words, some ecosystems are more difficult to study than others; sometimes the quantification of energy transfers has to be estimated. Net consumer productivity is the energy content available to the organisms of the next trophic level. Assimilation is the biomass (energy content generated per unit area) of the present trophic level after accounting for the energy lost due to incomplete ingestion of food, energy used for respiration, and energy lost as waste. Incomplete ingestion refers to the fact that some consumers eat only a part of their food. For example, when a lion kills an antelope, it will eat everything except the hide and bones. The lion is missing the energy-rich bone marrow inside the bone, so the lion does not make use of all the calories its prey could provide. Thus, NPE measures how efficiently each trophic level uses and incorporates the energy from its food into biomass to fuel the next trophic level. In general, cold-blooded animals (ectotherms), such as invertebrates, fish, amphibians, and reptiles, use less of the energy they obtain for respiration and heat than warm-blooded animals (endotherms), such as birds and mammals. The extra heat generated in endotherms, although an advantage in terms of the activity of these organisms in colder environments, is a major disadvantage in terms of NPE. Therefore, many endotherms have to eat more often than ectotherms to obtain the energy they need for survival. In general, NPE for ectotherms is an order of magnitude (10x) higher than for endotherms. For example, the NPE for a caterpillar eating leaves has been measured at 18 percent, whereas the NPE for a squirrel eating acorns may be as low as 1.6 percent. The inefficiency of energy use by warm-blooded animals has broad implications for the world’s food supply. It is widely accepted that the meat industry uses large amounts of crops to feed livestock. Because the NPE is low, much of the energy from animal feed is lost. For example, it costs about $0.01 to produce 1000 dietary calories (kcal) of corn or soybeans, but approximately $0.19 to produce a similar number of calories growing cattle for beef consumption. The same energy content of milk from cattle is also costly, at approximately $0.16 per 1000 kcal. Much of this difference is due to the low NPE of cattle. Thus, there has been a growing movement worldwide to promote the consumption of non-meat and non-dairy foods so that less energy is wasted feeding animals for the meat industry. Ecological pyramids, which can be inverted or upright, depict biomass, energy, and the number of organisms in each trophic level. Pyramids of numbers can be either upright or inverted, depending on the ecosystem. Pyramids of biomass measure the amount of energy converted into living tissue at the different trophic levels. The English Channel ecosystem exhibits an inverted biomass pyramid since the primary producers make up less biomass than the primary consumers. Pyramid ecosystem modeling can also be used to show energy flow through the trophic levels; pyramids of energy are always upright since energy decreases at each trophic level. All types of ecological pyramids are useful for characterizing ecosystem structure; however, in the study of energy flow through the ecosystem, pyramids of energy are the most consistent and representative models of ecosystem structure. The structure of ecosystems can be visualized with ecological pyramids, which were first described by the pioneering studies of Charles Elton in the 1920s. 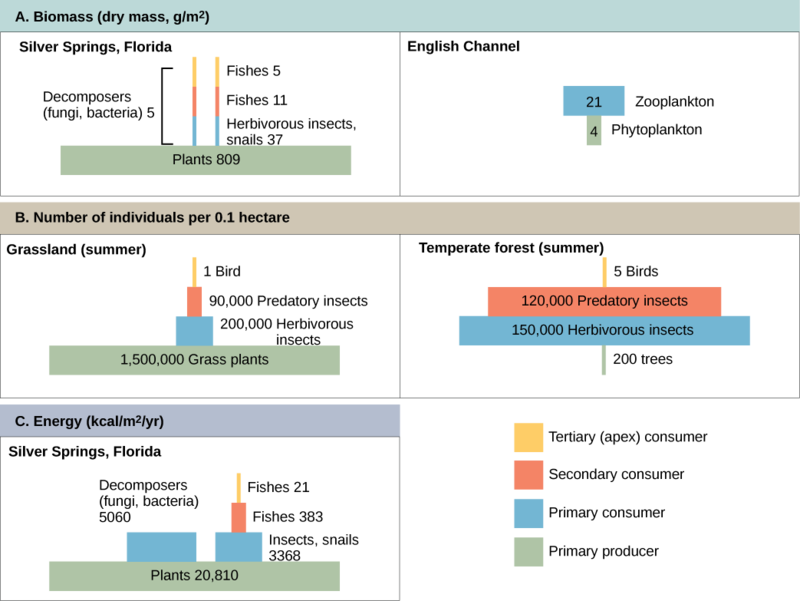 Ecological pyramids show the relative amounts of various parameters (such as number of organisms, energy, and biomass) across trophic levels. Ecological pyramids can also be called trophic pyramids or energy pyramids. Pyramids of numbers can be either upright or inverted, depending on the ecosystem. A typical grassland during the summer has an upright shape since it has a base of many plants, with the numbers of organisms decreasing at each trophic level. However, during the summer in a temperate forest, the base of the pyramid consists of few trees compared with the number of primary consumers, mostly insects. Because trees are large, they have great photosynthetic capability and dominate other plants in this ecosystem to obtain sunlight. Even in smaller numbers, primary producers in forests are still capable of supporting other trophic levels. Ecological pyramids: Ecological pyramids depict the (a) biomass, (b) number of organisms, and (c) energy in each trophic level. Another way to visualize ecosystem structure is with pyramids of biomass. This pyramid measures the amount of energy converted into living tissue at the different trophic levels. Using the Silver Springs ecosystem example, this data exhibits an upright biomass pyramid, whereas the pyramid from the English Channel example is inverted. The plants (primary producers) of the Silver Springs ecosystem make up a large percentage of the biomass found there. However, the phytoplankton in the English Channel example make up less biomass than the primary consumers, the zooplankton. As with inverted pyramids of numbers, the inverted biomass pyramid is not due to a lack of productivity from the primary producers, but results from the high turnover rate of the phytoplankton. The phytoplankton are consumed rapidly by the primary consumers, which minimizes their biomass at any particular point in time. However, since phytoplankton reproduce quickly, they are able to support the rest of the ecosystem. Pyramid ecosystem modeling can also be used to show energy flow through the trophic levels. Pyramids of energy are always upright, since energy is lost at each trophic level; an ecosystem without sufficient primary productivity cannot be supported. All types of ecological pyramids are useful for characterizing ecosystem structure. However, in the study of energy flow through the ecosystem, pyramids of energy are the most consistent and representative models of ecosystem structure. When toxic substances are introduced into the environment, organisms at the highest trophic levels suffer the most damage. Biomagnification increases the concentration of toxic substances in organisms at higher trophic levels. DDT is an example of a substance that biomagnifies; birds accumulate sufficient amounts of DDT from eating fish to cause adverse effects on bird populations. The presence of polychlorinated biphenyls (PCB) in phytoplankton causes increased PCB concentrations in walleyes and birds. Heavy metals, such as mercury and cadmium, found in certain types of seafood can also biomagnify. One of the most important environmental consequences of ecosystem dynamics is biomagnification: the increasing concentration of persistent, toxic substances in organisms at each trophic level, from the primary producers to the apex consumers. Many substances have been shown to bioaccumulate, including classical studies with the pesticide dichlorodiphenyltrichloroethane (DDT), which was published in the 1960s bestseller, Silent Spring, by Rachel Carson. DDT was a commonly-used pesticide before its dangers became known. In some aquatic ecosystems, organisms from each trophic level consumed many organisms of the lower level, which caused DDT to increase in birds (apex consumers) that ate fish. Thus, the birds accumulated sufficient amounts of DDT to cause fragility in their eggshells. This effect increased egg breakage during nesting, which was shown to have adverse effects on these bird populations. The use of DDT was banned in the United States in the 1970s. Other substances that biomagnify are polychlorinated biphenyls (PCBs), which were used in coolant liquids in the United States until their use was banned in 1979, and heavy metals, such as mercury, lead, and cadmium. These substances were best studied in aquatic ecosystems where fish species at different trophic levels accumulate toxic substances brought through the ecosystem by the primary producers. In a study performed by the National Oceanic and Atmospheric Administration (NOAA) in the Saginaw Bay of Lake Huron, PCB concentrations increased from the ecosystem’s primary producers (phytoplankton) through the different trophic levels of fish species. 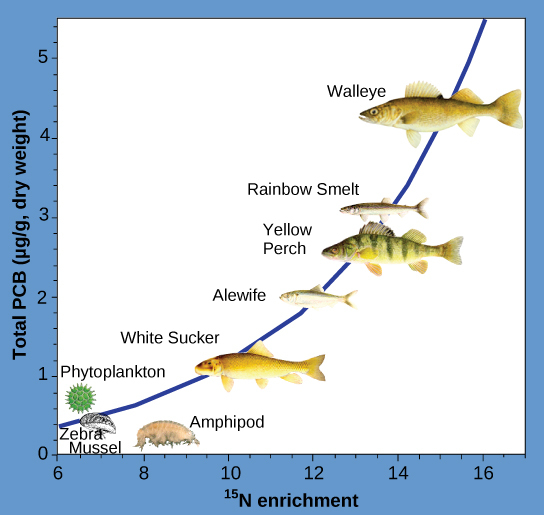 The apex consumer (walleye) had more than four times the amount of PCBs compared to phytoplankton. Also, based on results from other studies, birds that eat these fish may have PCB levels at least one order of magnitude higher than those found in the lake fish. PCB concentration in Lake Huron: This chart shows the PCB concentrations found at the various trophic levels in the Saginaw Bay ecosystem of Lake Huron. Numbers on the x-axis reflect enrichment with heavy isotopes of nitrogen (15N), which is a marker for increasing trophic levels. Notice that the fish in the higher trophic levels accumulate more PCBs than those in lower trophic levels. Other concerns have been raised by the accumulation of heavy metals, such as mercury and cadmium, in certain types of seafood. The United States Environmental Protection Agency (EPA) recommends that pregnant women and young children should not consume any swordfish, shark, king mackerel, or tilefish because of their high mercury content. These individuals are advised to eat fish low in mercury: salmon, sardines, tilapia, shrimp, pollock, and catfish. Biomagnification is a good example of how ecosystem dynamics can affect our everyday lives, even influencing the food we eat.